I’m a skirts and dresses kinda gal. Actually, I only own one (1) pair of pants and they look like this. Since I’m breastfeeding dresses are pretty much out of the question right now so it’s skirts seven days a week. That being said I really need some more skirts at the moment. 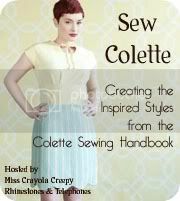 Good thing I found the Sew Colette challenge! But I’d like to share some other resources for easy skirt patterns, the circle and half circle skirt! Casey had an excellent circle skirt sew along last year: draft your own pattern and get lots of good advice and instructions on completing the project. Want to use less fabric? Chie offers a free pattern and instructions for a half circle skirt. Make the most out of your fabric! Amanda shows an economically layout for the circle skirt. You don’t really need to buy a commercial pattern, but they are great to look at for inspiration. Let’s make some more skirts!